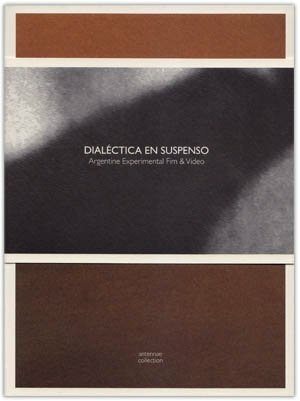 The antennae collection is proud to announce the release of the inaugural publication, Dialéctica en suspenso: Argentine Experimental Film and Video, a selection of eighteen works compiled by contemporary Argentine artists and film and video specialists Pablo Marín and Andres Denegri. One of the DVDs exhibits nine films created by different authors whose works were shot and presented on super 8mm and 16mm film. The other DVD contains nine videos created by different authors whose works were produced with a range of mediums (film, and/or other electronic forms) and presented on video. The Box set includes a 230 page bilingual book that presents essays written by the compilators, comprehensive biographical information about the artists and additional content related to Argentine experimental film and video. ¿Cine expandido o documental en vivo? Parte de un mismo proyecto mutante, en colaboración, que comprende un libro ilustrado y una futura película, esta “performance/proyección en formatos múltiples” incorpora una diversidad de materiales cinematográficos, textuales y musicales de ambos artistas: proyecciones múltiples en super-8, 35mm y video digital, fotografías, imágenes nuevas y de archivo, música electroacústica, grabaciones magnéticas, lecturas de viva voz. Claudio Caldini, pionero del cine experimental, y Andrés Di Tella, referente del documental en primera persona, exploran, por caminos diversos, un mismo eje: un experimento cinematográfico que es, a la vez, un experimento de vida.